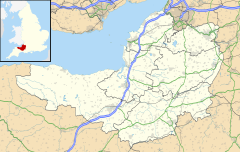 Portishead (/pɔːrtɪsˈhɛd/) is a coastal town on the Severn Estuary, close to Bristol, but within the unitary authority of North Somerset, which falls within the ceremonial county of Somerset, England. It has a population of around 25,000, with a growth rate considerably in excess of surrounding towns. Portishead has a long history as a fishing port. As a Royal Manor it expanded rapidly during the early 19th century around the docks, with supporting transport infrastructure. A power station and chemical works were added in the 20th century, but the dock and industrial facilities have since closed and been redeveloped into a marina and residential areas. Portishead was also the telephone control centre used by British Telecom (BT) for non-direct dialled calls to maritime vessels, a service known as Portishead Radio. The town's population is expanding, and Portishead is now primarily a dormitory town for Bristol and its environs, although a range of service industries has grown up. The headquarters of both Avon and Somerset Constabulary and Avon Fire Brigade are in Portishead. The name Portishead derives from the "port at the head of the river". It has been called Portshead and Portschute at times in its history and Portesheve in the Domesday Book, and was locally known as Posset. The town’s recorded history dates back to Roman times, although there is also evidence of prehistoric settlement, including polished flint axe heads. There were also Iron Age settlements in the area, of which Cadbury Camp was the largest. Other sites that have been identified include a 1,200 by 600 feet (370 by 180 m) site that was successively occupied by the Romans, Britons and Danes. There is some evidence that it may have been the western end of the Wansdyke, an early medieval or possibly Roman boundary with a series of defensive linear earthworks extending to the Savernake Forest near Marlborough in Wiltshire. After the Norman conquest the manor was held by the Bishop of Coutances and later reverted to the crown, after which William II gave it to a merchant from Bristol known as Harding and then to his son Robert Fitzharding who became Lord of Berkeley. The Berkeley family held it for generations until it passed by marriage to the Cokes of Holkham in Norfolk. In the 14th century it belonged to Everard le Frenshe. In 1621 the Bristol Corporation purchased large portions of land in Portishead and revived the Manor Court. The rights of the corporation over the manor was disputed but they held it until 1836 when they sold it for £8,050. The parish of Portishead was part of the Portbury Hundred. The town was built on the mouth of a small tributary of the Severn Estuary near the mouth of the River Avon. The old pill or jetty provided protection for craft against the Bristol Channel's large tidal range, and iron rings can be seen in the high street at which fishing boats used to moor. Its position meant Portishead was used to guard the "King Road", as the waters around the headland are called. In 1497 it was the departure point for John Cabot on the Matthew. A fort was built on Battery Point, and was used during the English Civil War when the town supported the Royalists, but surrendered to Fairfax in 1645. Guns were also placed at Battery Point during World War II. The King Road was the site of a naval action in 1758 when HMS Antelope captured HMS Belliqueux, one of a French squadron returning from Quebec. A mill was built on Welhay stream but this was replaced by tidal mills. In the 17th century the City of Bristol bought the manors of North Weston and Portishead for access to the channel and as a place to stay outside of the city and, in the 19th century, as a seaside resort. An outer sea wall was built allowing the local marshes to be drained and increased the land available for farming. The dominant architecture is early Victorian, with some buildings maintaining their original features. The expansion in residential property coincided with the construction of the dock, pier and the rail link to Bristol. The Royal Hotel by the pier was built in a Tudor Gothic style in 1830, to provide accommodation and catering for travellers on the steamers from Bristol, Wales and Ireland. The Act of Parliament governing the enclosure of Portishead was passed in 1814, and stipulated the right to a public wharf, although there is historical evidence of nautical connections dating back to the Patent Rolls of 1331. Around the 1860s, at the height of the iron and steel era, a pier and a deep-water dock were built by the Bristol & Portishead Pier and Railway to accommodate the large ships that had difficulty in reaching Bristol Harbour. They brought valuable cargoes from across the globe and exported local products overseas. Ships carrying coal were commonplace in Portishead Docks. In the 1880s Portishead Dock was acquired by Bristol Corporation, and was subsequently managed as part of the Port of Bristol until its closure. The Portishead power stations were coal-fed power stations built next to the dock. Construction work started on Portishead "A" power station in 1926. It began generating electricity in 1929 for the Bristol Corporation's Electricity Department. In 1937 its original six short chimney stacks were replaced by a 350 ft (110 m) high stack. A second 350 ft (110 m) stack was added when the power station was expanded in 1948. Construction of Portishead "B" power station began in 1949; it became operational in 1955. The power stations became part of the nationalised electricity industry after 1949, and were operated in turn by the British Electricity Authority, the Central Electricity Authority and the CEGB. They used some local coal produced in the Somerset coalfield, which was delivered by train along the Portishead branch of the Great Western Railway (GWR). The line had opened on 12 April 1867 as the Bristol and Portishead Pier and Railway Company; it opened to the dock on 5 July 1879. The main supply of coal was imported by boat from Newport and Ely in South Wales; it was carried by Osborn & Wallis of Bristol. Portishead had two passenger stations on the GWR's Portishead branch line. The main station was near the centre of the village of Portishead, as it was then; the other was at the pier. The construction of Portishead "B" power station caused the original railway station to be demolished and a replacement station was opened in the High Street on 2 January 1954. The new station closed on 7 September 1964. The majority of the line was reopened in 2002, to transport goods from the Royal Portbury Dock. A new junction was created, 3 miles (4.8 km) from Portishead station, and a new goods line built from there to the Royal Portbury Dock. There is a campaign group aimed at reopening the station and the short stretch of unopened line. In 2009 a report by the Association of Train Operating Companies stated that the Portishead branch was a special case for future consideration of reopening due to the large projected increase in population and congestion in the area. Portishead also had a second, short-lived, railway line: the Weston, Clevedon and Portishead Railway. It ran between Weston-super-Mare and Clevedon as a standard railway line, and between Clevedon and Portishead as a light railway. The Clevedon to Portishead extension opened on 7 August 1907. The line closed on 19 May 1940 and was then dismantled by the GWR. In 1951, Albright and Wilson built a chemical works on the opposite side of the dock from the power stations. The chemical works produced white phosphorus from phosphate rock imported, through the docks, into the UK. Phosphate rock was stored in concrete silos on the dockside until it was required. Electricity provided by the local power stations was used to run six 7.5 megawatt electric arc furnaces (45 MW total) that reduced the phosphate rock. The phosphorus was then moved in sealed railway tanks to Oldbury and to Kirkby. After the closure of the factory the decontamination included the removal of yellow (spontaneously combustible) and red allotropes of phosphorus. The site is now home to Portishead volunteer coastguard. The onset of new generating capacity at Pembroke (oil-fired) and Didcot (coal-fired) in the mid-1970s brought about the closure of the older, less efficient "A" Station. One generator (500 MW) of four at each of the new power stations had almost the same output of both Portishead Stations combined ("A" Station 200 MW, "B" Station 360 MW). The newer of the two power stations ("B" Station) was converted to burn oil when the Somerset coalfields closed. The two Radstock pits ceased production in September 1973 and the last train load of coal departed on 16 November 1973. The price of oil rose steeply in the 1970s (see 1973 oil crisis and 1979 oil crisis) and the two power stations were little used after these events. Portishead "A" power station was closed in 1976; and the first of its two chimney stacks, a landmark, was demolished in September 1981, followed by the second in August 1982. Portishead "B" power station closed in 1982 and both of its 383 feet (117 m) stacks were demolished in October 1992. Industrial activities ceased at the dock with the closure of the power stations. The Port of Bristol Authority finally closed the dock in 1992. Much of the growth of Portishead's population can be attributed to the development of the former docks. The former deep-water dock, used to supply coal and goods to the power stations, has been fully redeveloped into a modern marina with 250 pontoon berths. The areas on each side of the marina, formerly occupied by the two power stations and chemical plant, have been redeveloped to provide a wide range of housing, from town houses to social housing to exclusive flats. Development has also completed on the Portbury Ashlands to the east of the harbour (so-called because they were the dumping ground for power station waste) extending the area of the town further towards Portbury. Next to the Ashlands development lies Portbury Ashlands Nature Reserve. This waterfront development is now known as Port Marine. The area has varied styles of housing, including an area built in the style of a fishing village, which is modelled on the Cornish seaside town of Polperro with narrow streets and multi-coloured houses. New waterside bars and restaurants, including Hall & Woodhouse, Aqua and Bottelinos have opened around the marina, with further outlets are set to open in the future, including Costa Coffee and a nearby Wetherspoons. Portishead was previously the telephone control centre used by British Telecom (BT) for non-direct dialled calls to maritime vessels, a service known as "Portishead Radio". This has now been largely replaced by INMARSAT, which permits directly dialled calls made from any BT landline in the UK. The radio station had separate transmitting and receiving stations. They were constructed by the Marconi Wireless Telegraph Company and operated by the General Post Office (GPO). By 1936, the station had a staff of 60 radio officers who handled over 3 million words of radio traffic per year. Following the privatisation of the GPO's telephone network in 1981, the station was operated by British Telecommunications PLC (now known as BT Group PLC). The main transmitting station, which was remotely operated, originally consisted of a large array of radio masts at nearby Portishead Downs but was replaced by a single radio mast at Clevedon. It was used until the 1970s. The receiving station's control centre and radio masts were located at Highbridge, near Burnham-on-Sea. The radio station played a vital role during the Second World War in maintaining communications with the British merchant navy and with patrol aircraft in the North Atlantic. During the war, all communications with ships were one-way in order to avoid revealing the ships' locations to the enemy. The station was short-staffed because many were on secondments to various government services, such as operating other radio stations and training new radio officers to work in naval convoys. In 1943, the workload was so great that a Royal Navy officer and 18 telegraphists were brought in from HMS Flowerdown, a Naval Shore Wireless Service station near Winchester. By the end of the 1980s, satellite communications had started to take an increasing share of the station's business, and a programme of severe rationalisation began, leading to the closure of two transmitting sites at Leafield and Ongar. In the radio station's penultimate year to March 1999, there were on average, per month, 571 radio telegrams, 533 radio telephone calls and 4,001 radio telex calls. In 1998, British Telecom Maritime Radio Services announced its planned closure of Portishead Radio. The long-range services (HF bands 3–30 MHz) ceased at midnight on 31 August 1999. The short-range VHF maritime band services (156–174 MHz) closed at 12:00 on Sunday 30 April 2000, and the medium-range services (MF maritime band 1.6–3.0 MHz) at 12:00 on Friday 30 June. The station closed in April 2000. The Highbridge station has been demolished. Sedgemoor District Council adopted a local development plan in September 2004 that included the site of the receiving station for future housing development. Planning permission was granted in October 2007 for a development of 190 houses and flats on the site and shortly afterwards the old radio station buildings were demolished. The town is the larger area served by the town council of Portishead. The council is made up of 18 councillors representing six wards: Portishead Central, Portishead Coast, Portishead East, Portishead South & North Weston, Portishead Redcliffe Bay, and Portishead West. It has responsibility for local issues, including setting an annual precept (local rate) to cover the council’s operating costs and producing annual accounts for public scrutiny. The town council evaluates local planning applications and works with the local police, district council officers, and neighbourhood watch groups on matters of crime, security, and traffic. The town council's role also includes initiating projects for the maintenance and repair of parish facilities, such as the village hall or community centre, playing fields and playgrounds, as well as consulting with the district council on the maintenance, repair, and improvement of highways, drainage, footpaths, public transport, and street cleaning. Conservation matters (including trees and listed buildings) and environmental issues are also of interest to the council. The town falls within the unitary authority of North Somerset, although the area below high-water mark, including the pier, is within Bristol. Before 1974, the parish was part of the Long Ashton Rural District. The police service is provided by Avon and Somerset Constabulary. Avon Fire and Rescue Service has a fire station in Portishead manned by retained firefighters, equipped with two water tenders each holding 1,800 litres. The South Western Ambulance Service has responsibility for the area. The parish is part of the North Somerset county constituency of the House of Commons. It has been represented since 1992 by Liam Fox, a member of the Conservative Party, who was Secretary of State for Defence. Six electoral wards exist in Portishead. Their areas and total populations are the same as quoted above. It is also part of the South West England constituency of the European Parliament. Portishead is a coastal town on the Severn Estuary. It lies north east of Clevedon and immediately south west of Avonmouth just across the River Avon, which forms the boundary between Somerset and Bristol. The city of Bristol is 6 miles (9.7 km) to the east and Portishead is approximately 110 miles (180 km) west of London. On clear days, Wales can be seen across the Severn Estuary from the town. The Eastwood area has been designated as a local nature reserve. It consists broadleaf woodland on a coastal limestone ridge which leads to Battery Point which had a defensive gun position and Portishead Point lighthouse is on the promontory. There is also geological interest in the fossils, folds and faults found in the area. The area immediately inland includes the Gordano Valley, which has been designated as a national nature reserve. The valley runs roughly north-east to south-west, between Carboniferous limestone ridges extending along the coastline between Clevedon and Portishead, and another ridge extending between Clevedon and Easton in Gordano. The area includes the villages of Clapton in Gordano, Weston in Gordano, Easton in Gordano, Walton in Gordano, Portbury and Sheepway. The M5 motorway runs along the south side of the valley, splitting briefly into two levels – the south-west-bound level running above the north-east-bound carriageway. The Gordano motorway service station is at the eastern end of the valley, near the Royal Portbury Dock and the Avonmouth Bridge. There is no river Gordano – much of the valley is reclaimed land barely above sea level, drained by ditches (known locally as "rhynes"). The rhynes previously managed by the now amalgamated Gordano Valley Internal Drainage Board are now the responsibility of the North Somerset Internal Drainage Board. An area comprising a total of 400 acres (160 ha) has been designated as a biological and geological Site of Special Scientific Interest, for ornithological, entomological and stratigraphic interest, notification originally having taken place in 1971. Several sites in the valley are managed by the Avon Wildlife Trust as nature reserves. These include Weston Big Wood, Clapton Moor, Weston Moor and Walton Common. The name Gordano comes from Old English and is descriptive of the triangular shape of the whole valley from Clevedon to Portishead, being the ablative singular of the Latinised form of Gorden meaning muddy valley. Denny Island is a small rocky island of 0.6 acres (0.2 ha), with scrub vegetation, approximately three miles north of Portishead. Its rocky southern foreshore marks the boundary between England and Wales, but the island itself is reckoned administratively to Monmouthshire, Wales. The tidal rise and fall in the Severn Estuary and Bristol Channel can be as great as 49 ft (15 m), second only to Bay of Fundy in Eastern Canada. There has been concern about pollution levels from industrial areas in Wales and at the eastern end of the Bristol Channel; however, this tends to be diluted by the Atlantic waters. There are measurable levels of chemical pollutants, but little is known about their effects. Of particular concern are the levels of cadmium and to a lesser degree residual pesticides and hydrocarbons. Portishead Pier to Black Nore SSSI is a 177-acre (72 ha) geological Site of Special Scientific Interest notified in 1952. The Portishead Pier Section is made up of alluvial sandstones, the best exposure of Upper Carboniferous rocks in the Avonmouth Coalfield. The cliff and foreshore exposures around Portishead Point provide important exposures of geological structures formed during the Variscan mountain building episode in the Carboniferous Period of geological history. Also included are important exposures of the Devonian sequence that yield several species of fossil fish. Holoptychius scales are the most abundant fossils, but teeth scales of other species are also relatively common. Notably amongst the collection from this bed are plates of arthrodires, including Groenlandaspis. Eastwood and Battery Point Local Nature Reserve is a 9 hectares (22 acres) woodland containing Yew, Maple, Dogs mercury and beech. The Lake Grounds area, built in the early 20th century around an artificial lake, is the town's main park. Adjacent to the beach and esplanade is a 100-year-old artificial lake, and a cricket pitch surrounded by sloping lawns interspersed with specimen trees. One of the UK's few surviving outdoor swimming pools is situated on the shore next to the lake grounds and is open during the summer months. In 2009, the outdoor pool was renovated by a team filming for the American TV programme Ty's Great British Adventure. Above the lake grounds is Battery Point, where a gun battery was sited to protect the Severn Estuary from invasion. Along with the rest of South West England, Portishead has a temperate climate generally wetter and milder than the rest of England. The annual mean temperature is about 10 °C (50 °F) with seasonal and diurnal variations, but the modifying effect of the sea restricts the range to less than that in most other parts of the United Kingdom. January is the coldest month, with mean minimum temperatures between 1 °C (34 °F) and 2 °C (36 °F). July and August are the warmest, with mean daily maxima around 21 °C (70 °F). In general, December is the dullest month and June the sunniest. The south-west of England enjoys a favoured location, particularly in summer, when the Azores High extends its influence north-eastwards towards the UK. Portishead had a population of 22,000 in 2016, an increase of over 3,000 since the figure of 17,130 recorded in the 2001 census, with a growth rate of 40 per cent, which is considerably in excess of surrounding towns. As the result of a house-building programme, a further 8,000 people are expected to settle in the area by 2026, making Portishead one of the largest towns in North Somerset. Local employers include the Avon and Somerset Constabulary, which has its headquarters on the western edge of the town, Gordano School, and numerous care homes for the elderly, as well as a retail complex. The Victorian High Street has retained a number of local shops, such as Morgan-Westley, The Outlet, Careys DIY and Zebra, despite some larger DIY chains and supermarkets being built—Homebase, Argos, Waitrose, New Look, Peacocks and Pets at Home. In January 2010, Sainsbury's applied for planning permission to build a new store, soon followed by Lidl, Travelodge and Subway. All of these new stores have now been built. More retailers moved into the area in 2015, such as Wetherspoons, Costa Coffee. Aldi (to occupy the former Co-op premises), Majestic Wine and Home Bargains. Court House Farmhouse dates from the medieval period but was remodelled in the 17th and 19th centuries. The Grade II* listed building is owned by Bristol City Council and in 2010 protests from local residents attempted to stop its sale. The red brick National Nautical School was built by Edward Gabriel in 1905, at a cost of £30,000. Previously it had been based on the training ship HMS Formidable and operated until 1983. It is now part of a private gated community known as Fedden Village. The remains of a former windmill, built in 1832 but disused since 1846, were rebuilt into a two-storey house and then, in 1908, incorporated into a golf club house. The building has since been converted into a pub. A small, disused, black village pump remains in Portishead with a strapped down handle. The 9-metre (30 ft) high Portishead Point lighthouse was built at Battery Point in March 1931 by the Chance Brothers of Smethwick. The lighthouse is currently maintained by the Bristol Port Company. Black Nore lighthouse was built in 1894. It was electrified in World War II. In October 2011, after it was no longer needed for navigational purposes, it was sold to a trust for preservation at a cost of £1. The Royal Hotel in the area of Woodhill was designed and built to serve Brunel's railway line which finished a few steps away from the Hotel. The original building survives as The Royal Inn pub. It was built in 1830 by the Corporation of Bristol (now known as Bristol City Council) in order to provide a hotel supporting the development of the seaside resort. It is thought to be the only seaside hotel to be built by a public authority during the nineteenth century. It is a Grade II listed building. One of the Wright StreetLite buses introduced to the X2 and X3 services in 2014 outside the Post Office. Transport links to Bristol and beyond have been a concern for some residents of the town and a group has been set up to campaign for the reopening of the Portishead to Bristol railway line. The cost has been estimated at £28 million, and feasibility plans are being considered. The main A369 road, known after the historical name for the area as "The Portbury Hundred", which links the town to the nearby M5 motorway, is prone to congestion, especially during rush hours. Major traffic-flow modifications have caused much controversy because they are widely seen as having caused queuing where none existed before. More than 4,000 residents signed a petition to North Somerset Council expressing concern at the development. In September 2009 a trial was undertaken to turn off traffic lights in Portishead. It was conducted in association with North Somerset Council, Martin Cassini and Colin Buchanan. The change was made permanent after some journey times reportedly fell by over 50% with no measured reduction in pedestrian safety, despite greater numbers now using the route (over 2,000 vehicles and 300 pedestrians an hour). Portishead is served by several bus routes, including the half-hourly X3/a and X4, all to Bristol, as well as local buses such as the (circular) Route 88 to Congesbury, Yatton and Nailsea (actually split into 88A and 88C) and the X5 to Weston-super-Mare or Cribbs Causeway. A lifeboat service has been operated by the Portishead Lifeboat Trust since 1996 but in 2015 this transferred to a new RNLI lifeboat station adjacent to the pier. The Unitary Authority of North Somerset provides support for 78 schools, delivering education to approximately 28,000 pupils. Infant and primary schools in Portishead include: High Down Infant and Junior, Portishead Primary, St. Joseph's Catholic Primary, St. Peter's C of E Primary and Trinity Anglican Methodist Primary School. Secondary education is provided by Gordano School. In 1999, the school was awarded Specialist Schools Technology College status (see awards). Gordano School enrolls approximately 1,800 students annually, ages 11–19. The official opening took place on 12 July 1957. The school had cost £146,000 and still needed work to the playing fields. By September of that year, pupil numbers had increased to 500 and councillors were demanding more classrooms. The increase was attributed to the "post-war bulge". In September 1975, £209,000 was allocated for new buildings. Gordano was named the "Big Experiment" as it became Somerset's first comprehensive school, with 900 students and 30 teachers. The education department forecast the school numbers would treble by 1975. In 1994, an astroturf sports playing surface was laid at a cost of £260,000. Numbers had grown to 1,589 students and 88 teachers. In 2009 the school was awarded academy status. Much redevelopment of the site has since occurred, these include a new specialised sixth-form center, an English block, a new maths building as well as extensions to the Science, Creative Arts and Design and Technology Buildings. Most recently there has been a new sports hall opened this includes a new gym and indoor sports facilities. As of 1 September 2016 High Down Infant and Junior Schools, Gordano School, Portishead Primary School and St. Peter's C of E Primary School in the town, and St. Mary's in nearby Portbury formed a Multi Academy Trust (MAT) called The Lighthouse Partnership. Trinity Anglican Methodist School has become part of the Bath & Wells Multi Academy Trust (MAT). The Norman Church of St Peter (shown right) was built in 1320 and rebuilt in the 14th and 15th centuries in the Perpendicular Gothic style. In 1952 it was made a Grade I listed building. The four-stage tower is a prominent landmark, with set back buttresses and a pierced parapet. The church was altered in 1978–1979 and has a new garden developed for the Millennium. The Chapel of Portishead National Nautical School (now The Fedden Village) in Nore Road, dates from 1911. It is dedicated to St. Nicholas and is also a listed building. There is also a thriving URC church which dates from 6 March 1840. One of the early benefactors was Henry Overton Wills of the Wills tobacco family, who were staunch Congregationalists. Portishead has a sports and leisure complex, which was partly funded by the National Lottery as well as by funds from the Town Council and North Somerset Council. It houses a large swimming pool, leisure and play pools, indoor bowls, six badminton courts, a gymnasium, a fun room for toddlers, a cafeteria and a licensed bar. Other sporting facilities in the town include open-air tennis courts, a large outdoor swimming-pool opened in 1962 (and renovated in 2009), a boating lake, cricket ground, football and hockey pitches as well as many cycle lanes. The cricket club dates back to the 19th century. Portishead Town F.C. played in small regional leagues for years until joining the Somerset County League in 1975. They won the Premier Division title four times in five years between 1993–94 and 1997–98. After their fourth successive runner-up campaign in the 2004–05 season, Portishead successfully applied for promotion to the Western League. In Portishead's first season of Western League football they finished in the top half of the table only to better their performance the following season. In 2006–07 Portishead achieved their highest ever finish in the history of the club, finishing runners-up to Truro City. The Bristol-based trip hop group Portishead took their name from the town, despite describing it as their "dreary home-town". Chaos UK is a punk band that was formed in Portishead in 1979. The town was also the birthplace of leading Scrumpy and Western singer Adge Cutler. There are various groups and societies in the town, including the Gordano society that is involved in history, conservation, environment, planning and wildlife issues, a horticultural society, and the Portishead Railway Group that is campaigning for the Portishead to Bristol railway line to be re-opened. There are also church and youth organisations such as the Portishead Youth Club, a choral society, which was formed in 1955, and an annual carnival. A public art programme started in 1999 from the marina development, as part of a planning agreement between the developers (Crest Nicholson and Persimmon Homes) and North Somerset Council. An art trail takes in 28 public art works around the marina and Ashlands development. In 1989 the town twinned with Den Dungen, a small town of approximately 6,000 inhabitants about 3 miles (4.8 km) from the city of 's-Hertogenbosch, capital of the Province of North Brabant in the Netherlands. Den Dungen was a separate municipality until 1996, when it was merged with Sint-Michielsgestel. In 1992 a further twinning arrangement was made with Schweich, the principal town in a municipality of some 20,000 people, 6 miles (9.7 km) from the Roman city of Trier. This municipality is in the Trier-Saarburg district, in Rhineland-Palatinate, Germany. It is situated on the river Moselle, about 6 miles (9.7 km) northeast of Trier. Schweich is the seat of the Verbandsgemeinde ("collective municipality") Schweich an der Römischen Weinstraße. Frederick Weatherly, song lyricist who wrote the words to "Danny Boy" and "Roses of Picardy"
Geoff Barrow, member of the band Portishead, moved to the town with his mother when his parents separated. ^ a b c d e f g "Population of Portishead". Portishead and North Weston Town Council. Retrieved 29 August 2018. ^ a b Farr, Grahame (1954). Somerset Harbours. London: Christopher Johnson. p. 49. ^ a b c d e f g "Portishead History". Guide2 Portishead. Archived from the original on 16 August 2010. Retrieved 17 March 2010. ^ "Portishead". GENUKI. Retrieved 3 December 2009. ^ a b c d Robinson, W.J. (1915). West Country Churches. Bristol: Bristol Times and Mirror Ltd. pp. 115–119. ^ "Somerset Hundreds". GENUKI. Retrieved 19 October 2011. ^ Lewis, Samuel (1848). "Portishead (St. Peter)". 'Poolton – Portishead', A Topographical Dictionary of England. British History Online. pp. 593–596. Retrieved 17 March 2010. ^ Newman, Paul (1976). Channel Passage. Kingsmead Press. p. 2. ISBN 978-0901571748. ^ "The Royal Hotel". Images of England. English Heritage. Retrieved 17 March 2010. ^ a b Awdry 1990, p. 19. ^ Smith 1992, p. 96. ^ a b c d Winter 2005, pp. 106-113. ^ Elkin, P. W. "Aspects of the recent development of the port of Bristol" (PDF). AHDS. Retrieved 26 February 2010. ^ a b c d e f Crowhurst, pages 62–66. ^ Winter 2005, pp. 177-180. ^ a b Crowhurst 2001, pp. 45–50. ^ "Portishead Railway Group". Portishead Railway Group. Retrieved 1 December 2009. ^ a b Crowhurst 2001, pp. 51-56. ^ a b c d Awdry 1990, p. 242. ^ "Albright and Wilson Ltd" (PDF). ICI. 1960. Retrieved 3 December 2009. ^ "Decontamination and Remediation Works at Albright & Wilson, Portishead". IDS Environment. Archived from the original on 22 November 2008. Retrieved 3 December 2009. ^ "Portishead HM Coastguard". Guide to Portishead. Retrieved 3 December 2009. ^ "Portishead Quays". Quay Marinas. Retrieved 5 August 2016. ^ "Port Marine". Port Marine. Retrieved 14 February 2010. ^ a b c Crowhurst, page 78. ^ a b c Bennett, Larry; Lea, Brian. "The Story of Portishead Radio" (PDF). Portishead Radio -GKA. Larry Bennett. Archived from the original (PDF) on 12 August 2013. Retrieved 25 November 2012. ^ "Maritime Radio". Stonehaven Radio Station. Archived from the original on 20 November 2008. Retrieved 3 December 2009. ^ "The Town Council". Portishead and North Weston council. Retrieved 1 December 2009. ^ "A Vision of Britain Through Time : Long Ashton Rural District". Archived from the original on 22 March 2012. ^ "About Portishead Fire Station". Avon Fire and Rescue Service. Archived from the original on 19 November 2008. Retrieved 13 March 2010. ^ "Liam Fox". They work for you. Retrieved 24 June 2010. ^ "UK MEPs for the South West". European Parliament UK Office. Archived from the original on 27 February 2012. Retrieved 6 June 2012. ^ "Eastwood and Battery Point Local Nature Reserve, Portishead". Avon Local Nature Reserves. Archived from the original on 23 September 2015. Retrieved 23 August 2015. ^ "Eastwood and Battery Point". Retrieved 23 August 2015. ^ "Gordano Valley NNR". Natural England. Retrieved 31 January 2010. ^ "Footsteps into History – Clapton in Gordano". Western Daily Press. 22 September 2009. Archived from the original on 22 March 2010. Retrieved 18 March 2010. ^ Cameron, Kenneth (1988). English Place-Names. London: B.T. Batsford Ltd. p. 98. ISBN 978-0-7134-5698-1. ^ "Severn River Basin District" (PDF). Envioprnment Agency. p. 3. Archived from the original (PDF) on 30 September 2010. Retrieved 28 September 2010. ^ "State of the park report. Chapter 5 Coasts" (PDF). Exmoor National Park. Archived from the original (PDF) on 28 July 2008. Retrieved 5 August 2008. ^ "Landscape and Nature Conservation" (PDF). Severn Estuary Coastal Group. Archived from the original (PDF) on 23 July 2011. Retrieved 2 December 2009. ^ "The Lake Grounds". Portishead. City Web Design. Archived from the original on 1 March 2012. Retrieved 1 December 2009. ^ "Turn out to welcome Ty to Portishead pool". Bristol Evening Post. This is Bristol. 13 June 2009. Archived from the original on 12 September 2012. Retrieved 1 December 2009. ^ Crowhurst 2001, p. 82. ^ a b "South West England: climate". Met Office. Retrieved 14 March 2010. ^ "About south-west England". Met Office. Archived from the original on 7 October 2008. Retrieved 21 June 2006. ^ "Parish of Portishead and North Weston" (PDF). 2001 Census Parish Information Sheet. North Somerset Council. Archived from the original (PDF) on 7 June 2011. Retrieved 8 August 2009. ^ "Topic paper Demography, deprivation and social exclusion" (PDF). North Somerset Council. Retrieved 2 January 2018. ^ "Bristol Evening Post". This is Bristol. 11 February 2010. Archived from the original on 18 April 2010. Retrieved 14 February 2010. ^ "Court House Farmhouse". Images of England. English Heritage. Retrieved 17 March 2010. ^ "High Street protest march over farm sell off". Bristol Evening Post. This is Bristol. 26 February 2010. Archived from the original on 21 April 2013. Retrieved 6 June 2012. ^ "Portishead Nautical National School". Images of England. English Heritage. Retrieved 1 December 2009. ^ "New Building for the National Nautical School". Fedden Village. Archived from the original on 20 August 2010. Retrieved 3 December 2009. ^ "BTS Formidable and the National Nautical School". Fedden Village. Archived from the original on 30 August 2010. Retrieved 3 December 2009. ^ "Fedden Village". Fedden Village. Archived from the original on 29 December 2010. Retrieved 3 December 2009. ^ "Remains of former windmill in the Golf Club". Images of England. English Heritage. Retrieved 1 December 2009. ^ "Somerset, North Somerset, Bath & NE Somerset". Village Pumps. Retrieved 10 April 2016. ^ "Portishead Point A5484 – Bristol Channel, UK". The Lighthouse Duo. Retrieved 1 December 2009. ^ "Black Nore Lighthouse". Fedden Village. Archived from the original on 28 January 2013. Retrieved 22 September 2012. ^ Fowler, Tracey (25 January 2012). "Bought for £1 – residents preserve historic lighthouse". Weston, Worle and Somerset Mercury. Archived from the original on 14 July 2014. Retrieved 22 September 2012. ^ "Welcome". Royal Inn. Retrieved 10 April 2016. ^ "History". Royal Inn. Retrieved 10 April 2016. ^ "Royal Hotel". National Heritage List for England. Historic England. Retrieved 10 April 2016. ^ "Portishead Railway Group". Portishead Railway Group. Retrieved 3 December 2009. ^ "Portishead rail link 'will take six years'". Bristol Evening Post. This is Bristol. 3 April 2009. Archived from the original on 5 January 2010. Retrieved 3 December 2009. ^ "Town may get new railway station". BBC. 28 January 2009. Retrieved 3 December 2009. ^ Mason, Mary. "Portbury Hundred". Mary Mason. Retrieved 1 December 2009. ^ "Report of Meeting 22 November 2005". North Somerset Council. Archived from the original on 7 June 2011. Retrieved 3 December 2009. ^ "Lights out at Portishead traffic junction". The Bristol Evening Post. 15 September 2009. ^ "Portishead could become traffic light-free zone". South West Business. Archived from the original on 19 October 2010. Retrieved 8 October 2010. ^ "Consultant and film producer team up to 'push boundaries' of junction controls". TransportXtra. 17 July 2009. ^ "Portishead traffic lights set to stay out after trial". Bristol Evening Post. This is Bristol. Archived from the original on 5 May 2013. Retrieved 6 June 2012. ^ "Portishead Lifeboat: new station plans get go-ahead". BBC. Retrieved 27 October 2014. ^ "History". Gordano School. Retrieved 14 February 2010. ^ "School consultations announced on the formation of a Multi-Academy Trust - Gordano School". www.gordanoschool.org.uk. ^ a b "Church of St Peter". Images of England. English Heritage. Retrieved 8 April 2009. ^ "St Peter, Portishead". Church of England. Retrieved 8 April 2009. ^ "Chapel at Portishead National Nautical School". Images of England. English Heritage. Retrieved 1 December 2009. ^ "Portishead United Reformed Church". Retrieved 17 March 2010. ^ "Historical overview". Portishead Open Air Pool. Retrieved 17 March 2010. ^ "A brief club history". Portishead Cricket Club. Archived from the original on 27 July 2009. Retrieved 17 March 2010. ^ Weisel, Al (23 February 1995). "New Faces: Portishead". Rolling Stone. Archived from the original on 25 January 2010. Retrieved 17 March 2010. ^ a b "History". Wurzel World. Retrieved 9 July 2008. ^ "The Gordano Society". The Gordano Society. Retrieved 17 March 2010. ^ "Portishead Horticultural Society". Portishead Horticultural Society. Retrieved 17 March 2010. ^ "Portishead Railway Group". Portishead Railway Group. Retrieved 17 March 2010. ^ "Portishead Youth Centre". Portishead Youth Centre. Archived from the original on 15 November 2010. Retrieved 17 March 2010. ^ "Guide2 Portishead". Guide2 Portishead. Retrieved 17 March 2010. ^ "History of the Society". Portishead Choral Society. Retrieved 11 November 2010. ^ "Portishead Carnival". Guide2 Portishead. Retrieved 17 March 2010. ^ "public art story". Public Art — Port Marine. Retrieved 12 May 2011. ^ "Public Art: A Guide" (PDF). Public Art — Port Marine. 2009. Retrieved 12 May 2011. ^ "port marine, portishead — public art map" (PDF). Public Art — Port Marine. 2009. Retrieved 12 May 2011. ^ a b "Portishead Twinning". Guide to Portishead. Retrieved 14 February 2010. ^ "Repertorium van Nederlandse gemeenten 1812–2006". Royal Netherlands Academy of Arts and Sciences. Retrieved 3 December 2009. ^ Moseley, Brian (February 2011). "George Wightwick (1802-1872)". The Encyclopaedia of Plymouth History. Plymouth Data. Archived from the original on 4 February 2012. Retrieved 14 February 2015. ^ "Cream of local talent takes centre stage". Weston and Somerset Mercury. 1 October 2009. Retrieved 2 December 2009. ^ "Carol Vorderman faced 90% Countdown pay cut". Bristol Evening Post. This is Bristol. 28 July 2008. Archived from the original on 6 August 2008. Retrieved 2 December 2009. ^ "Thisisbristol.co.uk". Archived from the original on 14 September 2012. Awdry, Christopher (1990). Encyclopaedia of British Railway Companies. Patrick Stephens Ltd. ISBN 978-1-85260-049-5. Crowhurst, Ken (2001). Images of England: Portishead. Stroud: Tempus Publishing/The History Press Ltd. ISBN 978-0-7524-2240-4. Smith, Martin (1992). The Railways of Bristol & Somerset. Sherton: Ian Allan Publishing. ISBN 978-0-7110-2063-4. Winter, Michael T. (2005). The Portishead Coal Boats: A History of Osborn & Wallis Ltd, Bristol. Lydney: Black Dwarf Publications. ISBN 978-1-903599-13-6. Wikimedia Commons has media related to Portishead, Somerset. This page was last edited on 23 April 2019, at 13:33 (UTC).